A Tornado in GTA San Andreas. The Tornado is a two-door coupe featured in Grand Theft Auto: San Andreas and Grand Theft Auto V. In the former it is occasionally available as a lowrider. The Tornado in GTA San Andreas assumes the design of a late-1950s coupe, with signature sweeping curves and tailfins. The front half of the car (and most of the front bumper and grille) and rear window resemble those of a 1957 Chevrolet Bel Air, while the windscreen, sides, back side and bottom half of the front bumper resemble a 1958 Chevrolet Bel Air. The car serves as one of several gang cars for the Los Santos Vagos. 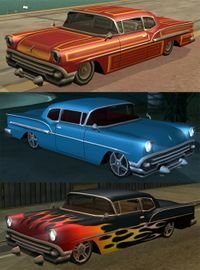 Although the car has appeared in both the first and second trailers for GTA V retaining a similar body design, the car has only been confirmed to be a "Tornado" on an early-2013 game art titled "The Trunk", where the rear end of a late-1950s car with a "Tornado" badge is illustrated. Grand Theft Auto: San Andreas (Rear quarter view). In the second Grand Theft Auto V trailer. Grand Theft Auto V, Ballas colours (Rear quarter view). In a GTA V game artwork. Having only two doors, the Tornado in GTA San Andreas is only designed to carry two occupants, and as a result, is not a good choice for drive-bys because it lacks the four-seats that many other gang cars have. The car does make up for this deficiency with its above average top speed and acceleration (faster than most four-door lowriders), as well as its generally stable cornering even with its long wheelbase that is supposed to hamper the car's maneuverability. Its low ground clearance, however, clearly makes the car unsuitable for rugged off-roading. The Tornado is also durable and can take a good bit of gunfire and collisions before exploding. Although it does not appear to have a visible fuel cap, it will explode if the back license plate is shot. Possible combinations of modifications that can be given to Tornados at Loco Low Co. in GTA San Andreas. The default radio station in the Tornado is Radio Los Santos in GTA San Andreas. The Tornado is the lowest vehicle in GTA San Andreas and the only lowrider and/or car capable of real dragging. Dropping its rear end on the ground produces a continuous stream of sparks like a minitruck. This trick can be executed through the aid of hydraulics by nose up with right analog stick (PS2), or the #8 button or, by pressing H, then #2 button (PC). The aforementioned picture of a Tornado-like car from GTA IV. In Grand Theft Auto IV, a picture depicting a car very similar to the Tornado is hung at the rearmost corridor of The Triangle Club, featuring double headlights (much like a 1958 Bel Air), and wheels with plastic rims used in GTA III and GTA Vice City. The render appears to be recycled from GTA San Andreas, appearing similar to various vehicle renders seen at the Driving School and Otto's Autos dating back to the development phase of GTA San Andreas. Usually found in Los Santos Vagos territories in Los Santos. After all Vagos territory is seized, the car will only appear under the following conditions. While driving a PCJ-600 in northeast Los Santos (Monday). While driving a Tow Truck or Ranger in ex-Vagos turf. Spawns often while driving a Blade. Though you have to carjack it, mark the map, and come back after a failed race, Tornados will spawn during Little Loop & City Circuit races in Los Santos. Spawns more often when the beater/junk car traffic cheat is activated. This page was last modified on 16 June 2015, at 21:50.